Aba’s tribute to Khuda Buksh continues with a recall of his years at EFU. Remember that Mr. Khuda Buksh passed away on May 13th, 1974 in Dacca. The war happened in 1971 but by then he had already left EFU and West Pakistan. His last year with EFU was 1969. These interviews were conducted between 2004 – 2005 by Aba with his tape recorder and transcribed by him alone by his own hands. I drove him to some of these sessions, I sat by as 80 year old men cried when reminded of the friend they had lost. The words are simple, the language sometimes awkward, sometimes plain. But what kind of a man leaves such a strong impression that thirty five years later friends, colleagues and strangers still remember him by the mark he left on the world. Cornelius Vander Starr established Asia Life Insurance Company in Shanghai to market life insurance business to the indigenous Chinese population in 1921. With a little knowledge of loss experience, however, the business fared well and flourished across China. The entire Far Eastern operations were virtually brought to a halt around 1941 by World War II. However, the business was resumed immediately after Japan’s surrender. Asia Life changed its name to American Life Insurance Company (ALICO) in 1951, and turned its eyes towards the Middle East, Africa and Southeast Asia, marketing its products to local people. This entire expansion was fueled, in part, by Starr’s philosophy of hiring, training, and promoting local people to managerial positions wherever the company opened its operations, a practice that remains American Insurance Group’s (AIG) culture even today, even after the death of Starr in late 1960’s. In 1952, the American International organization took an important step into the U.S. domestic insurance market by acquiring a majority interest in the Globe & Rutgers Fire Insurance Company and its subsidiaries, including American Home Insurance Company. Two years later Globe & Rutgers merged with American Home and took its name. M.R. Greenburg, who became the President of the American Home in 1962, moved to acquire other domestic companies. His strategy was to identify troubled companies or ones facing unwanted takeover threats, then buy controlling interests and then integrate them into the American International family. When Starr died and Greenburg was elected President, the structure of domestic property-casualty network was in place. Alico got the registration (permission) to start its life business operations in Pakistan on 1st January 1952. About a year later, Wisaluddin left Eastern Federal and joined ALICO as Vice President. The company could not have found a better local person for its business operations in Pakistan. Wisaluddin’s departure created a great vacuum in marketers of life insurance at the Head Office of Eastern Federal. Mr. J.B. Alladina, who joined Eastern Federal in 1950, says that Reyasatullah, a well liked and dynamic person, who was, at that time, the Chief Agent of the Company (a legal title for soliciting insurance business under the Insurance Act 1938) was given the responsibility of Assistant Manager Development for Life Business at Karachi. K.F. Haider, an experienced man of will and determination, observing the aggressive marketing approach of American Life (ALICO), moved Khuda Buksh to Karachi in 1959 to head the life operations of the company for both East and West Pakistan. Khuda Buksh accepted the tremendous challenge as an opportunity. Through planned and deliberate actions, he developed a highly motivated and dedicated marketing field force, aggressively seeking out clientele, and, in general, made life tough for foreign competitors. Eastern Federal Union Insurance Company Ltd. was in extreme financial strain in 1959/60, on account of bad underwriting of marine-hull business; and the accumulation of past several years’ claims in the same account. The company was on the verge of collapse. A petition was pending in the High Court for its dissolution. To save the situation, Mirza Ahmed Ispahani approached Abbas Khaleeli to come to Eastern Federal’s rescue. The Oxford educated Khaleeli was the most brilliant civil servant of India, and Pakistan, and a successful entrepreneur, as well. A major change in the ownership and top management of Eastern Federal Union Insurance Company Ltd. took place on January 1st 1961. The majority shares of the company changed hands from Ispahani Family to the ARAG Group and the top management was transferred to Abbas Khaleeli as the Chairman who brought with him Roshan Ali Bhimjee as the General Manager and Director of the company. After the successful turnaround and fully rehabilitating the company, Abbas Khaleeli resigned from Eastern Federal as the Chairman in 1965 to concentrate on his multifarious social, athletic, and business engagements as the Chairman of Associated Consulting Engineers, Canada Dry, Eastern Refinery, and an oil marketing company Burmah Eastern. In a short span of only three years (1960-1962), under the dynamic leadership of Abbas Khaleeli, Khuda Baksh in Eastern Federal was writing more sum insured and polices than the combined business of all the four foreign insurers writing life insurance business in Pakistan. Likewise, the total market share of in-force policies at the Year-end 1965 of foreign insurers was less than that of Eastern Federal; and by 1970 the company commanded about 37% of the total life insurance business conducted by the four foreign and forty local insurers in Pakistan. Although Karnowski, in his voluminous work – the twin books, “The EFU SAGA” and “Between Tears and Laughter”, dedicated only ten pages complementing the personality and the contribution of Khuda Baksh in the phenomenal progress of Eastern Federal. To a reader, Karnowski’s writings appear to be just a passing remark on the outstanding performance achieved by the marketing teammates of the portfolio holders of life business of the company. ‘No’, ‘Not now’, ‘Come later’, ‘I am busy’, ‘I don’t need it’, ‘I have a friend in the line’, ‘It’s un-islamic’, ‘It contains interest element’, ‘It’s a wager’, etc. General insurance marketing is generally free from such real or superfluous objections. In general insurance, usually, the customers approach the companies seeking cover for their properties or unforeseen liabilities; and, thus, the insurers have the power to refuse or extend the cover. It was the dynamic and persistent efforts of the marketers of life business, who sacrificed their family life, time, and energy that brought laurels to the company. And, long before life business was nationalized in Pakistan on 18th March 1972, Eastern Federal could claim “Every Second Person Is Insured With Eastern Federal”. Marketers, though enduring the extreme heats of Sibbi, below freezing temperatures of North West Frontiers, and challenging constant cyclones, thunderstorms, and the tropical rain forests of the Eastern Wing, did not tire of spreading the message of life insurance that brought Eastern Federal victory and made it the Leader in the field, not only in Pakistan, but also in Southeast Asia and Africa. Khuda Buksh had displayed exceptional caliber as a life insurance man in EFU. He was extremely successful as a business planner, sales man, sales executive and life insurance underwriter. The business volume of EFU in Life had attained a level that they could advertise that every second person having life insurance policy was insured with EFU. It was no mean success, in my view almost entirely to the credit of Khuda Buksh. It was however sad that he was not appreciated as much by the higher management of his Company. This was perhaps more out of jealousy and shortcoming in other life insurance executives within and outside the Company at that time. His success was not confined to the people of his own type but was all over Pakistan – at that time East and West Pakistan. The data indicating the performance of the insurance industry from all angles since 1959 – the year Khuda Buksh was moved to the Head Office of Eastern Federal to head the Life Business Operations of the company for both East and West Pakistan – is annexed in Tables-01 to Table-10, with a brief commentary, figures for the years 1959 to 1970, and bar charts at the end of this article. The data is loud and clear in highlighting the positive contribution of the dynamic man behind Eastern Federal, Khuda Buksh, and his team’s outstanding achievements, year after year. Everybody in the country knows that you are the Leader in the insurance industry. All these years, three words ring the air right from Peshawar down to Patenga and they are ‘You are LEADER’, ‘You are LEADER’ and ‘You are LEADER’, LEADER’, LEADER’ and LEADER’ were your watchwords. But how would you react in case your Leadership is snatched away? How would you feel in case Eastern Federal fails to continue its Leadership? How would you take it in case the business of Eastern Federal falls down? Khuda Buksh was a master par excellence of human behavior in dealing with field people. He incorporated into his, formal and informal, reward processes unique methods, techniques, ideas, and strategies to recognize and celebrate the achievement of superior performance by an individual or a group of people; hence further motivating them to excellence. Khuda Buksh had the passion for his job. By going through the mill in his early life with OGSLA he learnt the art of motivation. While traveling he would make telephone calls or send congratulatory letters for fine performance to each individual salesperson. (Notebooks and internet were nonexistent then.) Many times, he would send telegrams to the residence of each individual worker, appreciating and acknowledging his extraordinary performance. The delivery of congratulatory telegrams had electrifying effects enhancing the field person’s image among the family members. In those days, knocks on the door by the postmen, especially at nights, were considered to be for extremely important or serious events, and were supposed to carry important news for the family, as well as, the people living around the house. To involve the family Khuda Buksh would award household articles, such as wall clocks, tea sets, fruit sets or dinner sets, etc. as the prizes for all regular business contests. Besides qualifying for company’s conventions, in special business contests, the declared prizes would be gold medals, diamond cuff links, gold pendants or chains or other gold ornaments, etc. On many occasions, the declared prizes were suit pieces for men and saris for the contestants’ female family members. Some times, surprise prizes were declared before end of the months or the contests’ cut-off dates. Khuda Buksh would send telegrams to the family asking them to motivate the contestants to win by putting some extra hours in their daily work schedules. He never publicly claimed any in-depth technical knowledge of insurance or blew his own trumpet. As the Chief of Life Department, his self- acquired knowledge, experience and training at Oriental Government Security Life Assurance Co. Ltd. provided him with a very strong foundation to steer Eastern Federal’s Life operations to a dynamic and progressive path, beating all foreign and local competitors with a wide margin. Khuda Buksh vividly remembered the odd experiences, the difficulties and the frustrations in the job of a Life Insurance salesperson. He, therefore, expected all staff members to empathize with the vocation of sales people. 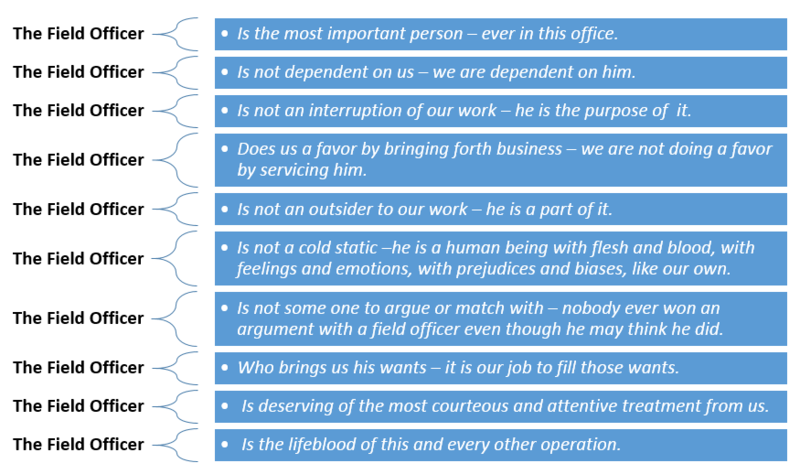 Thus, he advised the office staff to offer the marketers the most heartening responses – the kind of reassuring replies the field force needed – to rekindle their enthusiasm, to wash out their disappointments, frustrations, anger, anxiety, and despair, so they could find the light of hope at the end of the tunnel; and by pursuing their noble profession, reflect on their achievements and rewards. I remember Mr. D.M. Qureshi, District Manager, who recruited a new agent, who brought a reasonably large amount of premium on a new life policy, had to be garlanded. It was really amazing! A simple field agent being garlanded by the executives, officers and staff members; and, Khuda Buksh, the leaders, was also present there to garland the achievement of the new agent! I found Khuda Buksh very simple, and quite an unassuming. Difficult at that stage with a fresh MBA, or fresh business school training, to see such an unassuming person heading the largest life insurance company of Pakistan. And, then I began to question Mr. Dais, the Deputy Manager, and other officers of the company about Khuda Buksh, and gradually, I learnt more and more about him. As a reminder for the office staff of the importance of sales people, and of the way to interact with them, he had placed beautiful, polished teak-wood display panels behind the walls of the Officers of New Business and Agency Commission Sections with the following message, as the Mission Statement. Khuda Buksh was a workaholic. He kept his main residence in Dhaka. But he had taken an apartment in PECHS for residence, which was managed by a cook. He did not bring his family to Karachi for settlement. However, they used to visit him there occasionally, for a few days. When I met him, I found him very straightforward. He was a very good conversationalist. He was very lean and thin. At that time I found that he is the person who can deliver. To be very frank, it was only later on that I came to know the person was Khuda Buksh, who did his best to create a name for Eastern Federal in East Pakistan. Previously Muslim Insurance Company and Ideal Life (formerly Indian Life) were very active in East Pakistan. I also found him very tough and very humble. Khuda Buksh regularly remained in contact with all his wide circle of acquaintances. Naimuddin, who before joining ALICO in 1956, was the head of the renewal department in Eastern Federal, has very proudly shown me a letter addressed to him by Khuda Buksh on 30th June 1966, with a message, “These days I am staying at Karachi and I hope, we shall meet shortly.” Naimuddin cherished the letter like family heirloom. There was civil disturbance and killings in Karachi in 1964, and, as a result, curfew was imposed on the disturbed localities of Karachi. Hanfi, because of this curfew you will not be able to come out of your house. Many of our friends will also not be able to come out to the office. So, I have obtained two curfew passes one for you and one for my driver, and I am sending my car to you. In the boot of the car there are packets of flour, ghee, rice, and cereals packets, etc. Besides these items the driver has eight thousand rupees in cash. I have asked the driver to go to your house and take you to visit all our people residing in your locality. If any one needs anything you have to distribute these items. If any person needs any help, come down to my office so that we can arrange the required help immediately. I cannot ignore the help needed by the people working for my company or for me. Mr. Hanfi went to each employee and field person’s house around his locality and provided assistance as it was needed. There was a gentleman form the then East Pakistan, Muhammad Ali Akbar. His child was seriously ill. Because of the curfew, doctors and medicines were not available. Khuda Buksh arranged another pass for the doctor to visit the child patient and proper treatment and medicines were provided. I remember we had serious language riots and curfew was declared in Karachi continuously for three or four days. Mr. Taiq Mukhtar, who now works in Dubai for some local insurance company, narrated to me that during the curfew relaxation period Khuda Buksh had send people with envelops containing money to those areas where field workers and officers of Eastern Federal’s life department were living and effected due to the disturbance. Tariq also received such an envelope containing cash for the emergency use. I did not see any person take such care of their staff and field force on the general (non-life) business operations of the company. He (Khuda Baksh) was such a good man. When he was told that a field officer was not attending to the field calls and the office because he was not well and as a result was facing financial strains. Khuda Buksh went straight from the airport to visit his house. He inquired about the problems faced by him and the family that kept the person away from work. He instructed the Account Manager, who was accompanying him, to pay a certain amount of money to the field officer as an immediate relief, and also asked the officer to meet him next morning. The visit and the relief brought back the officer on the job. His constant efforts to help others, monetarily or otherwise made everybody very mobile. I have been in management throughout my life. There are only two types of people: those who work, and people who get work done. The interesting thing about Khuda Buksh was that he defeated that maxim. He could do the job himself, and, as well as he could get the task done by others. He did this in a very simple and unassuming way. In the late sixties agency commission was not much because of the low amount of policy premium. Many ladies (wives or mothers) of the field workers would visit Khuda Buksh narrating their financial and other domestic problems. One such lady called on Khuda Buksh and informed him that there was nothing in the house or kitchen for children to eat. In those days, Rs.50/- had value, and with that amount one could buy foodstuff for family kitchen for a week or so. For two or three months I along with Mr. Hamid Rashid Siddiqui used to deliver the ration to the family of the concerned officer at his residence which was next to Lal Masjid, in P.E.C.H.S. ( a posh locality of Karachi.) Khuda Buksh used a very good psychological ploy. The Sales Officer himself became embarrassed; and ultimately corrected himself by lowering the quality of cigarettes. Such reminiscences were not rare but were the norm in Khuda Baksh’s life. Many similar events have been narrated by Muhammad Chaudhary, Saifuddin Zoomkawala, M. Fasihuddin, Joseph Pereira, Hanfi, Sharafat Ali Qureshi, and Waris Ali Khan, and several others persons whom I interviewed for this article. Continued at Khuda Buksh – Tributes from the field force. Previous Previous post: Khuda Buksh. A life insurance leadership case study.